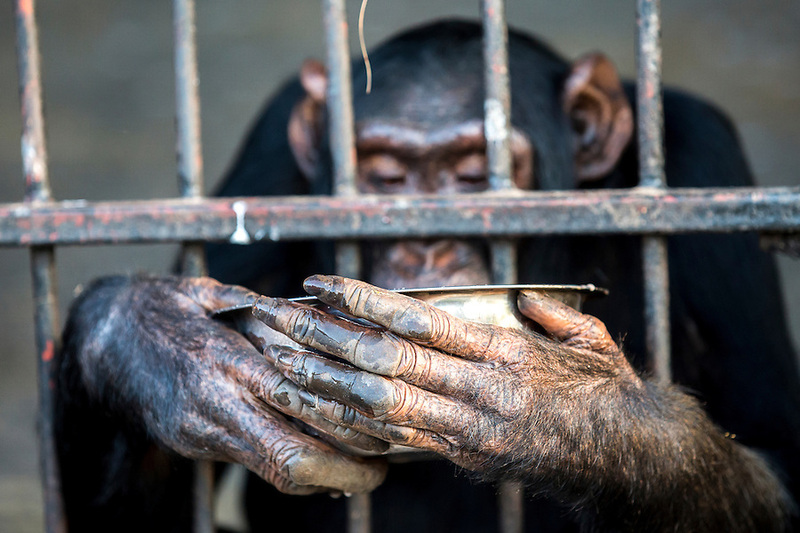 Female chimp, Medina, eats her evening meal of porridge at the Ngamba Island Chimpanzee Sanctuary in Lake Victoria, Uganda. Medina is a relatively tall chimp with a pink- brown face and little hair at the back of her palms; because of constantly sliding on the floor during play time. Medina is very creative and spends most of her time observing so she can learn from her environment. At arrival, her canine teeth had been removed and the front teeth smashed. She was malnourished with a big and hard stomach which was believed to have worms. However, she was treated and she has recovered steadily.